Are you curious about Tailwind? Or maybe you just got started and you want to know what Tribes can do for you? Before we get started on how to use Tailwind Tribes, let’s talk about what it is! Tribes is actually what drew me to use Tailwind to begin with. If you participate in blogging Facebook groups they might have a share thread where you share your post for others to promote and you reciprocate. Tailwind Tribes is very similar, except it’s just for your pins. 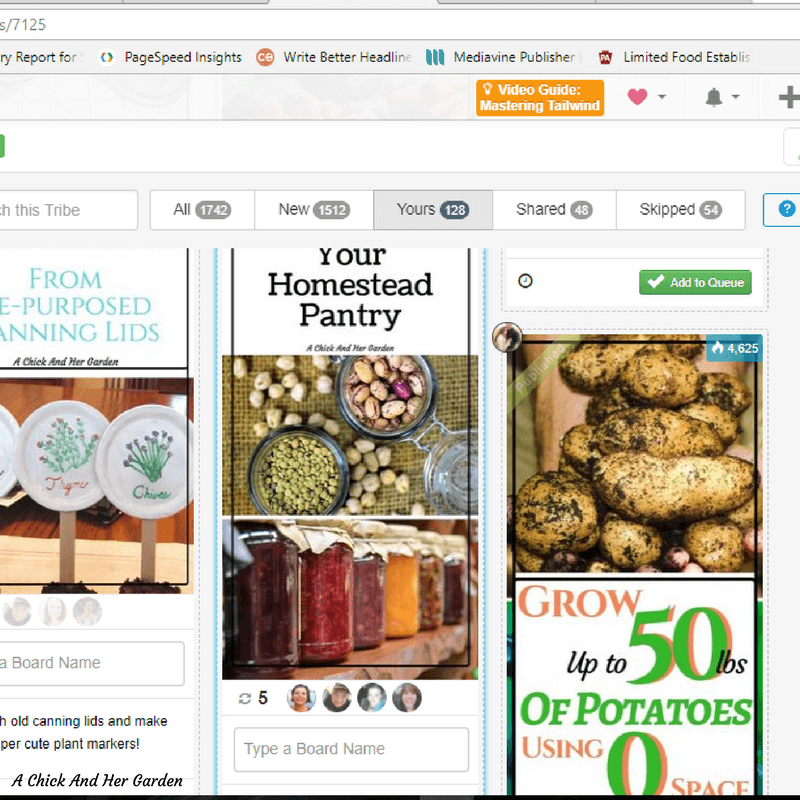 Pinterest brings in about 75-80% of my traffic each month. So to say it’s important is the understatement of the year! 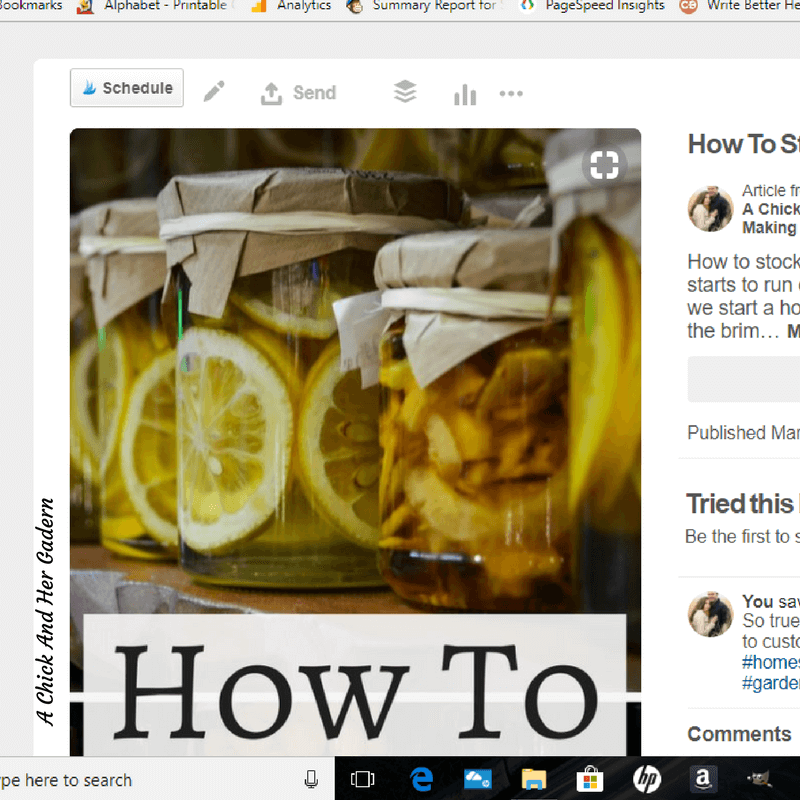 But to get rolling on Pinterest you need people to see and share your work! Tailwind Tribes makes that so much easier! 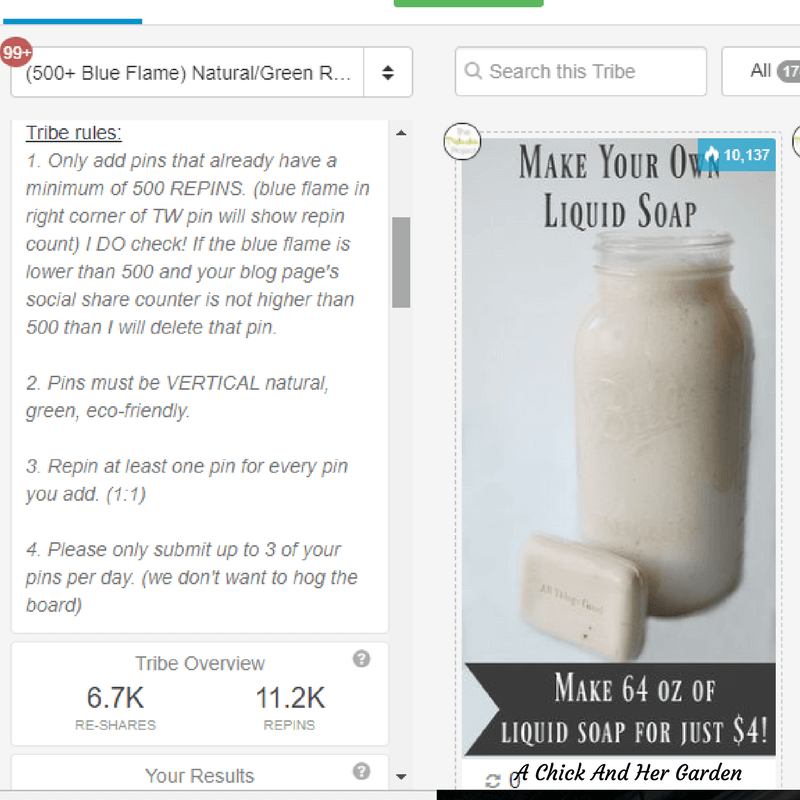 The basic concept of Tribes is to join a “Tribe” share your Pins, and share the Pins of fellow bloggers. Now that we know what Tailwind Tribes are, let’s talk about how to use Tailwind Tribes! 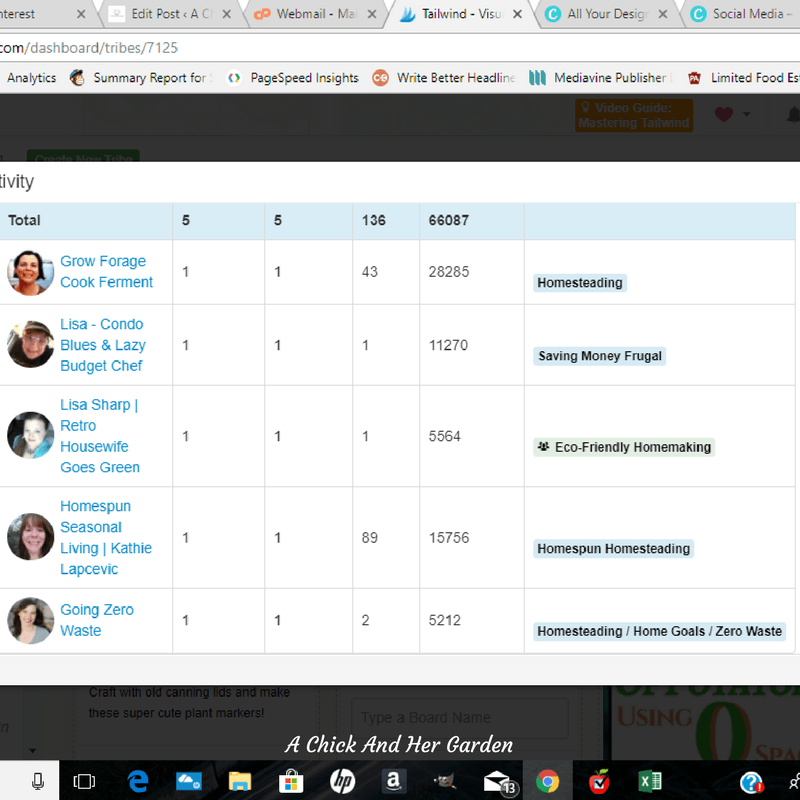 As I’ve said before, Tailwind is my number one tool in my blogging toolbox. But, I didn’t always feel that way. I actually started using Tailwind after being invited to a Tribe. 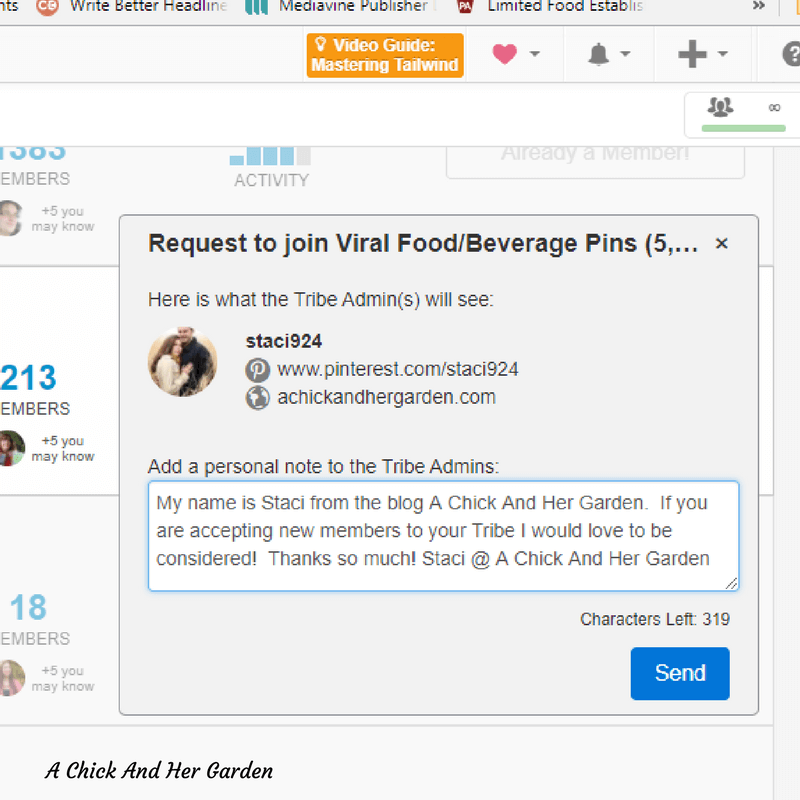 It was great to share my Pins and I loved the Pin Scheduler but the only way to be in a Tribe was by invite or creating your own. So it actually started getting a little bit monotonous. They were pins from the same people all the time and sometimes I like to write a few posts that aren’t actually a part of my niche (ahem, like this one…). So, then I can’t share those Pins in niche specific Tribes. Well, Tribes just upped their game by allowing us to search for Tribes to join! Yep that’s right! It’s almost like searching for group boards to join, only better! Depending on the level you’re using you can have an unlimited number of Tribes to join and pins that you add to the Tribes! When Tailwind started allowing us to search for Tribes to join, it not only opened up more Tribes, but the ones we were already in grew. 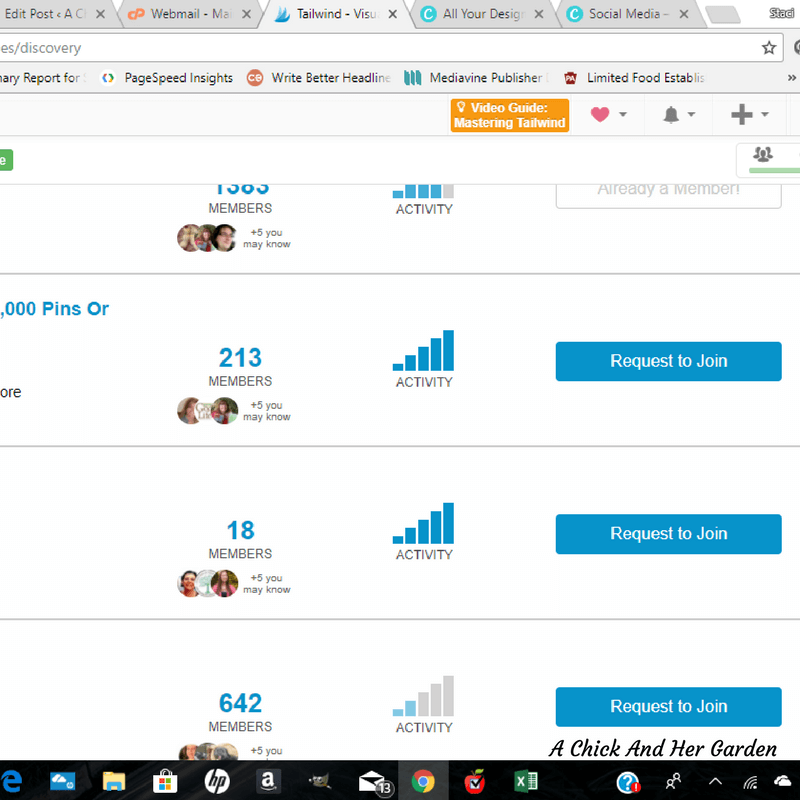 More people could find the Tribes to join, meaning more content for you to choose from for your own pinning AND more people sharing your content. Doesn’t that alone make you want to sign up for Tailwind??? 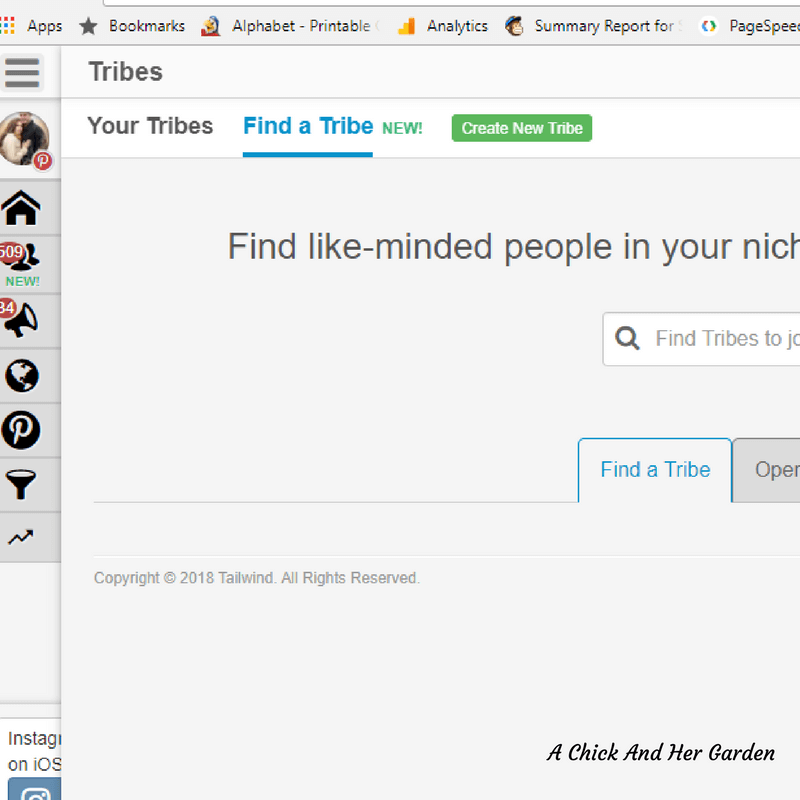 Type in a niche or keyword and a list of Tribes will pop up for you to choose from. Depending on the privacy settings for the tribe you can either “Request to Join” or “Join Now.” Before choosing I always look at the Activity of the Tribe. If it doesn’t have full, or at least 4 bars I won’t join. If you are requesting to join the Tribe leave a quick message asking to be considered as a member. Now You’re A Member! Here’s How to Use Tailwind Tribes! Alright! You are now a member of a Tribe or ten… Or 40! What do you do now?? Before you start flooding the Tribe with your pins, take a minute to read the rules of the Tribe. Some require that you repin one for each that you leave. Others require that you repin two for each pin left. Some also require that you only leave long pins or that they have a minimum amount of repins before you can add them. Here’s an example from one of the Tribes I’m in. Head over to Pinterest, and hopefully you have a “Best of….” board for your own content, to choose a Pin. 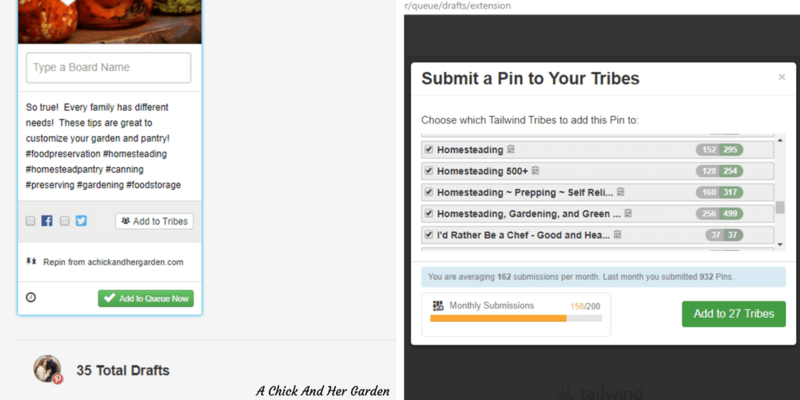 Choose a Pin and click on the Tailwind schedule button in the top left corner. In your new window you will click on “Add to Tribes” and a new window will pop up. Now you can select all of the applicable Tribes that you want to send that pin to. Wait… Is that it?? Well, yes that’s how easy it is to add you pins to a Tribe. But with the new updates Tailwind added another feature that I absolutely LOVE! Before you could see how many times a pin was shared in a Tribe. Now you have the ability to click on those stats, see who has shared it, what the reach is, and which boards it was shared to! Let’s Take a Look at How To Use Tailwind Tribes Stats! When you see your pin in your Tribe, at the bottom it will have a space with a number and a few images, if it has been shared. It will look like this. Click on those little circle images to take you to the stats for that pin. As you can see, this specific pin was shared 5 times, received 136 repins, and had a reach of 66,087! You can also see above, which boards the pin was pinned to. AND, you’ll see that one of them is a group board! How does that help you?? We all want more group boards to join. If you’re not already a member of that board, click on it and head over to the board to find out how to join! Last but not least, my final tip on How to Use Tailwind Tribes! So you’ve shared a pin once. That does not mean, never share it to the Tribe again! People are always joining Tribes. That means new members are coming in that haven’t seen that pin before. Not only that, some of the old members may not have see it the last time! Obviously you won’t want to add that Pin every single day. But I would say that once a month is a good gap! Do you think you’re ready to join Tailwind?? Through my affiliate link you get a month free! Still not sure?? Check out a few more reasons Why Every Blogger NEEDS Tailwind! Have you given Tailwind a try?? Tell me what you think in the comments! I joined my first few tribes yesterday, and added some pins to them. However, I did it from my blog post, not my pinterest board. I sounds like you recommend pinning first to your own account and then sharing them? I feel that could get confusing remembering what you’ve already shared! Also, mine show up as a draft in my little schedule feed- BUT I know they got shared because I saw them on the tribe pages. What am I doing wrong? Hey Melissa! Yes! I would recommend that you add from your “Best of” Board. I like to add in a cycle, so when I get to the most recent Pin I start from the beginning again. Also, if you are not then adding the pin to your scheduler, after adding it to the Tribes hover over the top right corner of the pin and a delete button will show up. That way it’s not adding to your drafts. Yep! I usually do the two at the same time unless my scheduler is pretty full.